Casual brides, this one's is for you! 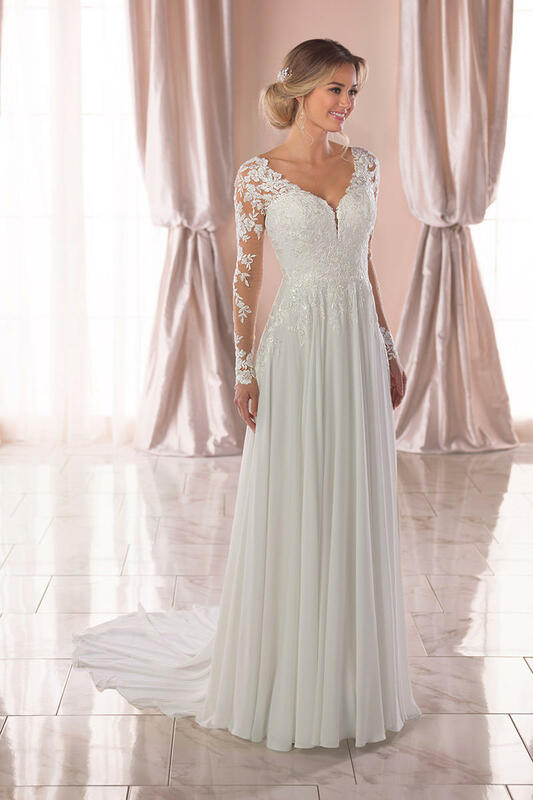 This long-sleeved wedding dress by designer Stella York is simply dreamy. Lace and flowy crepe chiffon create a simple yet refined sheath silhouette, but the real showpiece is the lace long sleeves! Beautifully gathered at the waist, the layers of chiffon create a gorgeously full effect without the weight, perfect for twirling across the dance floor. Floating lace has been placed on the sleeves and back for a light and airy feeling, while the full constructed bodice features lace that elongates the frame. A long crepe chiffon train is finished with fabric-covered buttons. This long sleeved casual wedding dress is also available in plus sizes.